While Labor Day is traditionally an excellent time to eat 15 hot dogs, try to swim in a lake, then cry because your cramps are too intense, it’s also a fine day to consider who’s revitalizing the American labor movement. Women, particularly black women, now make up the majority of newly organized workers and are leading prominent labor struggles like Fight for $15. The Wall Street Journal reports that women have been increasingly part of the labor movement since the early ‘80s, and are expected to make up the majority of union workers by 2025. Many of them are joining in traditionally low-wage sectors like fast food, where women and minorities are more likely to be employed. In 2014, according to the Bureau of Labor Statistics, men and women were union members at nearly equal rates: 11.7 percent of men and 10.5 percent of women. Compare that to 1983, when 24.7 percent of men in the workforce were unionized, compared with only 14.6 percent of women. While those numbers show in depressing relief how fast and far union membership in America has fallen, the good news is that unions are still surviving, becoming more diverse (black workers are now the most likely to be unionized, according to the BLS), and moving into new fields. Fight for $15 is making real gains in the fast food industry and new media organizations are unionizing one right after the other these days (ahem). Latino workers still have the lowest rates of union membership, a gap that labor organizations are trying hard to close. 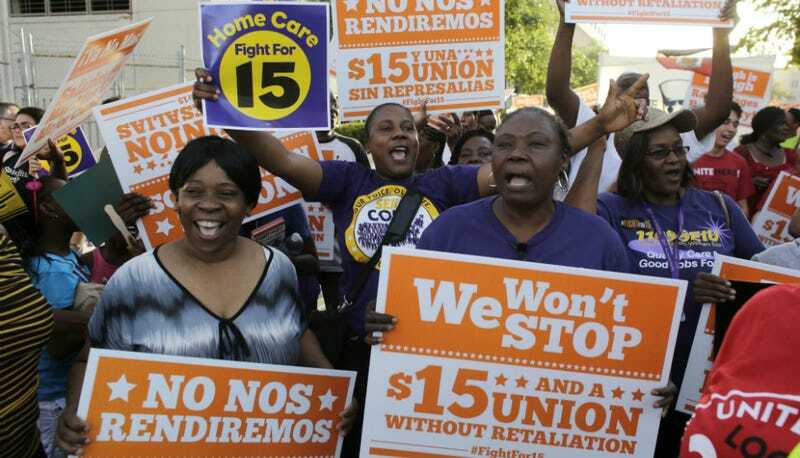 At NBC, Kimberly Freeman Brown points out the other labor organizations led by black women: the National Domestic Workers Alliance, North Carolina’s Forward Together Moral Movement, and Wisconsin Jobs Now, among others. They’re among the women profiled in Freeman Brown’s And Still I Rise, a report and “love letter” to black women in labor released this year. But, as always, this is a struggle in progress: And Still I Rise pointed out that while black women are joining unions in strong numbers, they’re not being promoted to leadership positions. Less than three percent of women surveyed had held an elected position of any kind, and less than five percent had been president of their union or labor organization. The advantages of union membership for women are pretty clear: as the Center for Economic Policy Research points out, union women make 13 percent more than their non-union counterparts on average, even in low-wage fields. They’re 36 percent more likely to have employer-sponsored health insurance, 53 percent more likely to have a retirement plan, and more likely to have a variety of benefits like paid sick days, family and medical leave, and paid vacations.